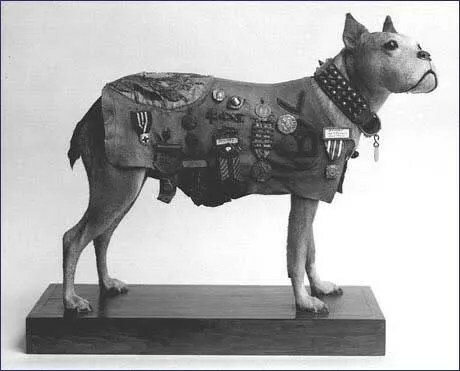 Stubby was the official mascot of the 26th “Yankee” Division during the First World War. He joined the rank and file of the 102nd Infantry Regiment at Yale Field in New Haven, CT in the Spring of 1917. He was a stray brindle terrier puppy of unknown origin and exact breed, but appeared to be several weeks old at the time he was found. Throughout his lifetime including his military service, his caretaker and master was John Robert Conroy of Pittsfield, Mass. During his time in training camp, Stubby became familiar with the bugle calls, marching drills and even learned to give a dog’s version of a salute with his right paw to his eyebrow when he saw others around him doing the same. 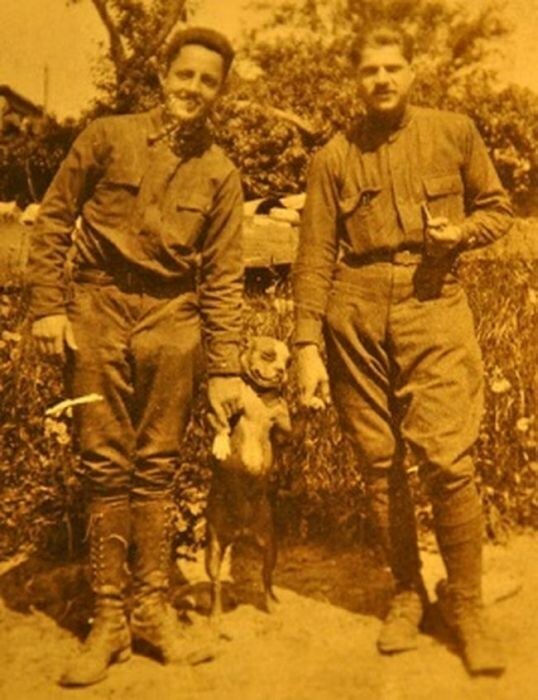 Stubby’s positive effect on the morale of the troops earned him the right to remain in camp even though animals were not allowed. In September, 1917 Stubby was smuggled aboard the USS Minnesota at Newport News, VA and sailed to France with the 102nd Infantry. He was hidden in a coal bin until the ship was too far out to sea to turn back. Once in France, Stubby was finally discovered by Pvt. Conroy’s commanding officer but was given special orders allowing him to remain with the troops as their official mascot. Following his master’s preliminary training in trench warfare, Stubby went into the front lines and was in the trenches by February 5, 1918. Fitted with his own gas mask, Stubby experienced multiple gas attacks and became skilled at warning the troops when gas was approaching their positions. He was credited with saving sleeping men in his company by running through the trenches while barking and tugging at their legs to wake them. When the gas alarm sounded, Stubby would leave the trench to avoid the gas until it cleared away. On April 20, 1918 Stubby was wounded in the right foreleg and chest by shrapnel from a German grenade during the fighting at Seicheprey. He was treated at a field hospital, and following surgery was moved to a recovery area where he convalesced and also improved the morale of the nursing staff and other wounded troops. Stubby participated in 17 engagements and four major campaigns including those at Aisne-Marne, Champagne-Marne, St. Mihiel and Meuse-Argonne. He earned one Wound Chevron (predecessor to the Purple Heart) and three Overseas Service Chevrons for his time in the lines (one for every 6 months Over There). Following the Armistice, Stubby met President Woodrow Wilson when the President visited the 102nd Infantry in France on Christmas Day, 1918. When the 102nd returned to the United States in early Spring of 1919, Stubby was again smuggled aboard ship for the voyage home. Stubby became a life member of the American Legion, American Red Cross and the YMCA. He continued to live a full life into the mid 1920’s and followed his master to Georgetown University Law School where he was also named the school mascot. Stubby passed away in his master’s arms on March 16, 1926 and was preserved for posterity with the assistance of the Smithsonian Institution. 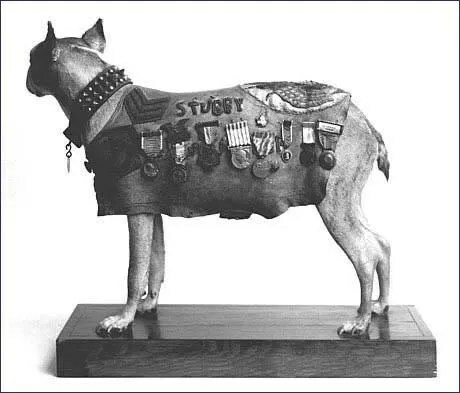 Today Stubby’s remains are on display as part of the Smithsonian exhibit The Price of Freedom: Americans at War in Washington, D.C. where he can be seen still standing at the ready and wearing his decorations on a chamois service blanket made for him by the grateful women of Chateau-Thierry, France. 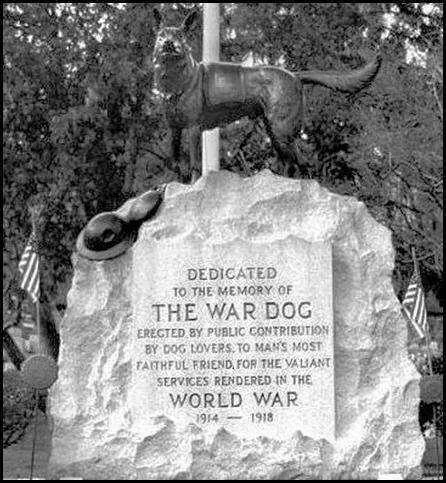 Stubby was also honored with a brick in the Walk of Honor at the National World War I Museum at Liberty Memorial in Kansas City, Missouri on Novermber 11, 2006. Special Thanks to Terry Waldron for permission to display her original oil artwork “Sgt. Stubby–WWI War Dog.” This work may not be reproduced without express permission of the artist. Please follow the link for Terry James Art & Frame at http://www.terryjamesart.com/ in order to procure this and other fine works of original historical art. I just discovered this site. Thanks for making it happen. Regarding Stubby on 20 April 1918, can you share your source? I am researching the battle of Seicheprey and have yet to find any data on Stubby other than what you have on this page. some of them are doing grate work. I’m researching the Yankee Division and wanted to ask you about your photo sources. I’m assuming they’re all in the public domain. 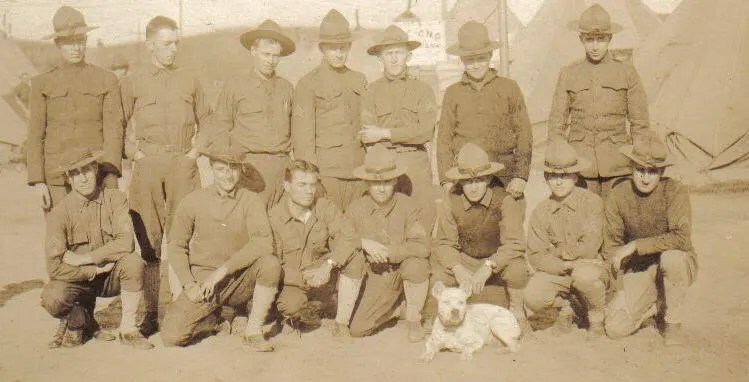 Can you tell me if one of the two men holding Stubby is Pvt Conroy? I’m currently writing a book on Stubby and my research sources indicate that Conroy and Stubby’s unit did not sail out on the U.S.S. Minnesota until October. A part of the 102nd did leave in September. Can you tell me what source you used for your September date? In the Bibliography Page you can find many direct links to digital archive copies of historical resources now long out of print. In particular, you should refer to the work New England In France 1917-1919 by Emerson Taylor. On Page 30 there is a chart which indicates departure and arrival dates by unit of the 26th Division. According to this chart, the 102nd Infantry departed the U.S. on Sept. 19 and arrived overseas on Oct. 9. 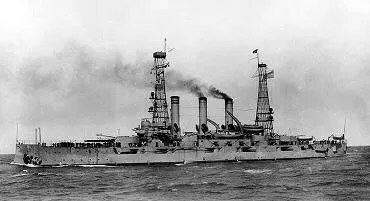 This same information is also cited by Frank Sibley in With The Yankee Division In France on Page 32. Record-keeping was not then what it is now, and reconstructing the historical record is not always easy. However, these are definitive historical accounts that places the 102nd Infantry in transit in September, 1917. Dear Terry, how is your book on Stubby progressing? What kind of extensive research have you done on the story? Have you spoken with any of Pvt Conroy’s descendants? Is the book published yet or soon to be? If so can I order a copy? In regard to the inquiry about my book on Sgt. Stubby: When I submitted my completed manuscript to National Geographic last August (2013), I learned two other people had beaten me to the punch. So mine will not be published. There are three books on Sgt. Stubby set for publication in the spring of 2014, two children’s titles and an adult. During my research, I did make contact with and have extensive communication with Corporal Conroy’s grandson. There are a few inaccuracies to Stubby’s history. I hope the authors have addressed these in their research. I can say that the Georgetown University photo purported to be Stubby is not. I have this on authority from a reference librarian archivist at Georgetown. The photo was taken in 1927, a year after Stubby’s death and features Jazz Bo—the first dog to carry the legendary ‘Hoya’ nickname. The only Georgetown photo that I am aware of is one of him chasing a football on the field and it is held by the University. 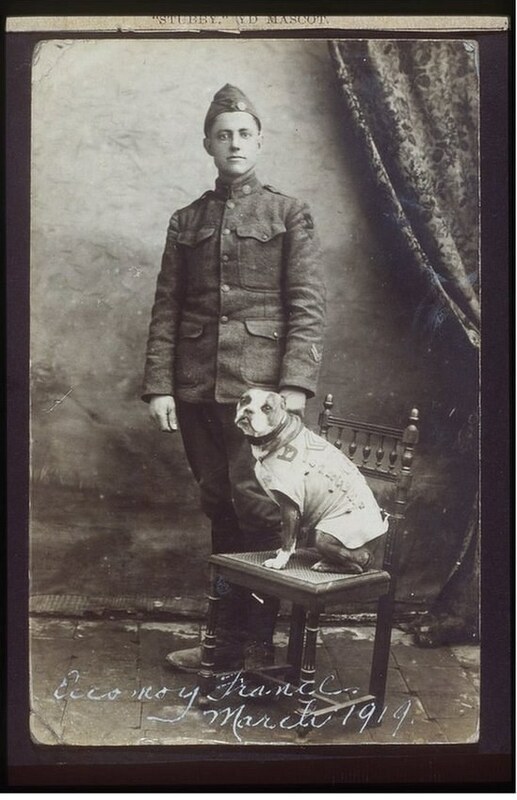 Second, Stubby’s caregiver was Corporal J. (James) Robert (Bob) Conroy. Because of his prior National Guard service, he held the rank of corporal. He was not a private. And he was not named John. 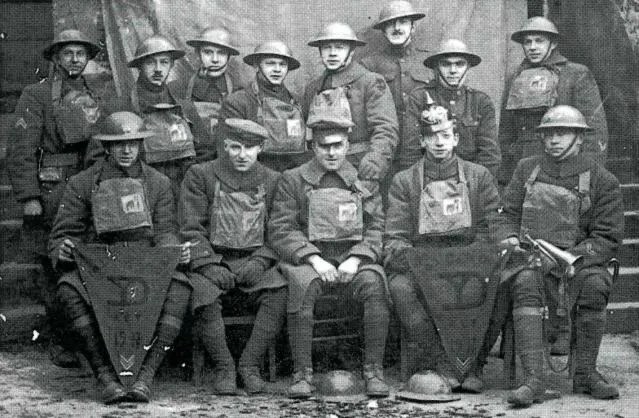 There were at least three J. Conroy’s serving in the 102d Infantry during the Great War. Because there were two Private John Conroys serving in the 102d at this time, some sources presume that the “J.” stood for John. That’s why many sources incorrectly list Stubby’s caregiver as Private John Conroy. John Edward Conroy of Bridgeport, Connecticut, who served in Company L, received two combat-related citations. 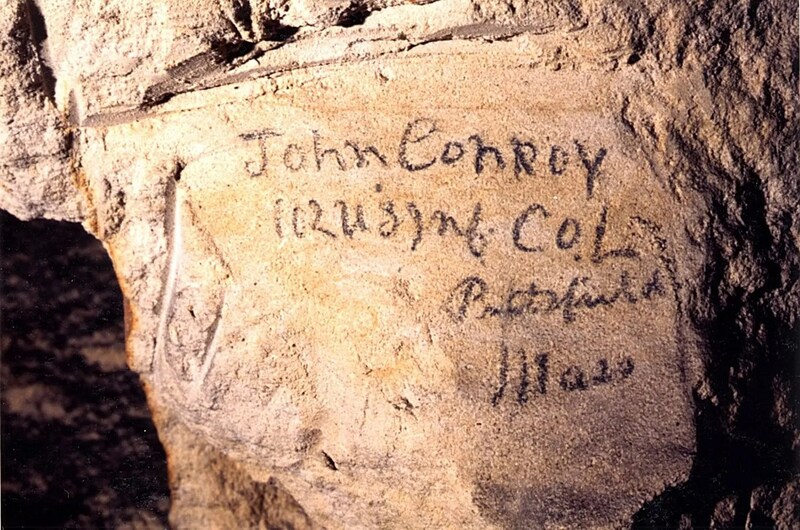 John Ernest Conroy of Pittsfield, Massachusetts, also served in Company L, and carved the stone at the ‘Quarry of the Americans’ in Froidmont. Third, Stubby did not arrive at Camp Yale until early August. Military records and histories state that the 1st and 2ndConnecticut regiments did not assemble at Camp Yale until mid-July of 1917. Stubby arrived shortly thereafter. He was very young at the time, about 5-6 months old. Fourth, Stubby was not brindle. He was tan with white markings. This is confirmed by Conroy’s grandson and his display in the Smithsonian’s The Price of Freedom: Americans at War exhibit. While I’m a little frustrated that after all this research, my book will not be published, I’m glad to see Stubby’s story being told. Since I had access to Conroy’s grandson, I will be interested to see the content of these three books. One of the myths associated with Stubby was that he only associated with, sought-out, and rescued English-speaking soldiers. This was not true. In fact, when Stubby’s unit was relieved of duty in the Chemin des Dames sector and ordered to Rimaucourt, the pit bull was left behind. He wasn’t recovered until four days later, when he returned with the company of a French military unit. According to Conroy’s grandson, Stubby was known to cross the lines and visit the Germans. In fact, the dog acquired his German Iron Cross on his own when he returned with it pinned to his coat, following one of his absences from camp. >>> his caretaker and master was John Robert Conroy of Pittsfield, Mass. Actually it was James Robert Conroy of New Britain, CT.